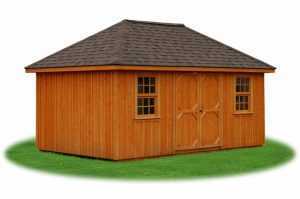 Are you looking for a shed with a roof to match your house’s hip roof? Here is your answer. The Hip Style is the same as the Peak with the exception of the roof. The 8/12 pitch roof slopes from all four sides with an 8” overhang. The hip roof style shed is available in all 6 of the siding options offered at Salem Structures, but the stained siding is very popular. The Hip Style has a unique appearance with its 4-sided roof slope. This is a great option to create that one-of-a-kind structure in your neighborhood. 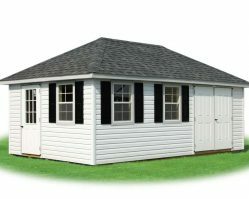 It has the same quality construction of our Peak style storage sheds, with a unique and desirable roof-line.